It is one of LOST's most coveted mysteries, how did John Locke wind up in the wheel chair? In this weeks all new episode of LOST, 'The Man From Tallahassee' the answer will finally be revealed! What other answers could this all new episode of LOST hold in store for us? What about the aftermath of last weeks revelation of Jack looking quite at home with 'The Others'? 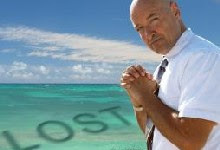 For more details on what to expect from this week's LOST, with minor spoilers, follow the link. 'The Man From Tallahassee' promises to be one of the most pivotal episodes of LOST yet. Not only will we witness the event that put Mr. John Locke in his wheel chair, we will get even more startling insight on 'The Others' and their connection to the island. Last week, Kate, Sayid, Danielle, and John Locke got to the edge of the barracks where 'The Others' lived and watched Jack having a great time playing catch with Mr. Friendly while clean cut cultists sauntered about with backpacks slung over their shoulders. This week, the search party enters the encampment with the goal of rescuing Jack, all but one. That one is John Locke. John has his own agenda. After 'Enter 77', a lot of fans have questioned John's actions. Is he trying to strand them there forever? This week we will see for certain that this is what John has in mind. Even when Ben offers Locke information on the island, it isn't enough to dissuade Locke's destructive mission as the bald one takes out the only way on and off the island, the Galaga submarine! As for the Jack situation, we know very little of what is going on. It looks like it will be a guessing game of 'is he with them or not'. But it appears that Kate is captured. Looking ahead to the first LOST in April, 'Left Behind', it sounds like Kate does get away, with Juliet. There is no mention of the fate of Sayid and Danielle. With the next episode, 'Exposi', slated to focus almost entirely on the past of the beach new comers Paulo and Nikki, it is a safe bet 'The Man from Tallahassee' will end with a major cliff hanger. What will become of John Locke after he destroys The Other's sub? How do Sayid and Danielle factor into the episode? That, you'll have to wait to find out. If you’re hungry for more revelations then Lost’s upcoming episode “The Man From Tallahassee” might just satisfy your craving. Like other episodes of Lost, "The Man From Tallahassee" entails a lot of flashbacks. But what’s interesting in this segment is that there would be a lot of eye-openers, specifically pertaining to Locke’s wheelchair. Finally, there’s an explanation to the ever-baffling cause of his disability. This 13th episode of Lost’s season three can be described as “Locke-centric.” Apart from the plot focusing much on Locke’s wheelchair exposure, the story lines also touches on Ben’s offer to give Locke some of the island’s secrets in exchange to call off Locke’s destructive plan. 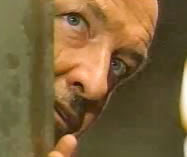 More importantly, this episode makes you understand why Locke is so engrossed with the island. As for Jack, his plot involves a lot of mystery especially when he is seen tossing a football with his enemy Mr. Friendly, which will get you to think if this is just part of his whole game plan. Whether his game plan involves pretending or being really converted by “the Others,” Kate’s discovery of his scheme might just add complications. To add more conspiracy, there will also be some exchange of roles. A person known to be in power will be powerless while another person takes over in a very intriguing way. Still can’t get enough? Catch the complete episode of “The Man From Tallahassee” on Wednesday, March 21, 2007. Guest stars include M.C. Gainey as Mr. Friendly, Tania Raymonde as Alex, Nestor Carbonell as Richard Alpert, Mira Furlan as Danielle Rousseau, Kevin Tighe as Anthony Cooper, Patrick J. Adams as Peter Talbot, Barbara Baehler as Mrs. Talbot, Don Nahaku as Detective Reed, Marlene Forte as Detective Mason, Stephen Bishop as William Kincaid, Cleo King as government worker and Brian Goodman as Ryan. Well, sort of. On the October 11 episode of Lost, there'll be a dream sequence (Locke is the one dreaming) in which Claire and Charlie are married. The dream also features Desmond as a pilot and Hurley as a flight attendant. According to TV Guide's Michael Ausiello, this episode may also include an appearance by a character who has left the show. Twelve weeks is a long time for LOST spoilers to seep out; at this rate will there be anything left by the time February rolls around? Our in-house sleuths, and those abroad, bring you the latest goodies from the world of LOST spoilerdom. Don't follow the jump if you don't want to be spoiled. Several new goodies to share with you this week, rumors to dispel, and new spoilers to make your wait even harder. 1) Despite wide-spread rumors, Matthew Fox's character, Jack, will not be shot by Juliet when LOST returns on February 7th. In-fact, Juliet will shoot Pickett who is on the verge of killing Sawyer, leaving herself in a precarious position with the others. 3) Sawyer, and Kate, return the beach at the end of the episode. 4) Episode nine is the final update on Jack's status. He stayed behind to repair Ben, but will he now get off the island as he was promised or not? 5) Need further evidence that Ben survives? Currently the plan is for the season three finale to be Ben centric. 6) Doc Arzt makes a return this season via flash-back. Not that thrilling, I know, but I can barely contain myself. 7) There are two more deaths planned after Pickett, both major character deaths. 8) A super secret spy tells us Patchy's name is either "Rainer" or "Ranier", but admits that the info is from very early development. French Dharma guy with an eye-patch? Sounds kinda groovy. 9) Bai Ling will play the tattoo artist who brands Jack in episode nine. 10) Libby fans will probably have to wait another season to get more of her story. The characters she crosses with in flashback have not been introduced, but are pivotal in a game-changing way. There have been many rumors surrounding the fate of Jack: death, turning to the other side, escapes from the island... as it turns out none of them are true, exactly. Actually, the truth leaves room for even more speculation. "The show has been shooting for two weeks, and I'm not there. And the show will continue to shot for another two weeks and I'm not there. I'm not going to tell you the reason why, suddenly, for a couple of episodes, Jack Shephard is not around. But there is a reason, within the story, absolutely." So when will Dr. Jack return? And under what circumstances? Will he become one of them as predicted? Only time will tell. LOST is finally returning and BuddyTV has the scoop on what is coming in 'Not in Portland' and beyond! Can you believe a LOST / Star Wars connection? And which LOST character is going to be seeing a lot of time on video game consoles this summer? First up, LOST Not in Portland. I have seen the episode and will be writing a review shortly. It was extraordinary. LOST fans looking for a big return will be happy to know that Not in Portland delivers. I was slightly disappointed by the continuing lack of beach folk, but assurances are that after three episodes, Alcatraz is a thing of the past. This is especially interesting since episode eight of LOST, which airs February 14th, titled 'Flashes Before Your Eyes" is a Desmond centric episode and is rumored to not feature the alcatraz island at all. So in this case, there is really only one more episode that takes place on Hydra island and that is 'Stranger in a Strange Land', a Jack Episode, that airs February 21st. Back to LOST Not in Portland. I have the power to spoil the entire episode, but I'm not going to do it. Instead, I'll give a few high points you may have not heard about anywhere else. 1. The episode begins with Juliet back in the 'world'. She is apparently part of a renowned fertility team, along with her obsessive and oppressive ex-husband. She is quite the opposite of our fist slinging, tough as nails Juliet. Ethan shows up later to recruit her for a job in Portland... (guess what... it's not 'In portland') the question of whether or not this is all Dharma related IS addressed if you play close attention. 2. Ben wakes up during the surgery. CLASSIC Black humor. 3. Kate and Sawyer are forced to take a side mission if they want to escape the island. that's all I'm giving you, and believe me it is NOTHING. There are moments in the episode that rival some of the high points of the story... I'm talking finding out that Locke was paralyzed, the Hatch map... you get the picture. Moving on. Let's jump WAY into the future. Episode 14 to be exact. This is where LOST and Star Wars collide in the guise of one Billy Dee Williams. Yes, Lando himself has signed on for a guest starring role as a charismatic 'other'. The episode also promises plenty of action as Locke, Sayid, Kates, and possibly others, locate the 'Others' village in a bid to rescue Jack. But does he want rescuing? 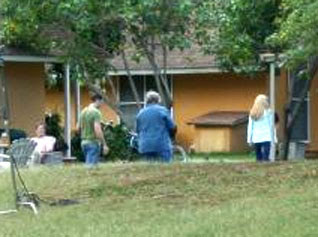 A picture taken from afar shows a rather cleaned up Jack taking a stroll with Mr. Friendly and Juliet. As we promised last week, tonight's episode of Lost (3.08, entitled "Flashes Before Your Eyes") promises to reveal a lot more about Desmond's past, as Charlie and Hurley try to figure out what happened to Desmond after the hatch implosion. Lost executive producer Damon Lindelof told Entertainment Weekly that the flashback device used in this episode is used in a totally new way that the show hasn't used before "and never will again." Irish actress Fionnula Flanagan appears as Ms Hawking in one of the flashbacks; Charlie appears in Desmond's flashback as well, apparently busking on a street corner in London. Sonia Walger returns as Penny, as does Alan Dale as Charles Widmore. Starting with next week's LOST "Stranger in a Strange Land," Chinese actress Bai Ling will appear in at least one and possibly three episodes as Jack's "mysterious" lover Achara, a plotline that according to Bai Ling includes "a psychological twist and betrayal." The episode (obviously) focuses on Jack, and promises to explain his tattoos, which are connected to Achara, who is an artist. Most of the episode's flashbacks seem to take place in Bangkok, Thailand. Cindy the flight attendant and children Zack & Emma also reappear in this episode of LOST. Cheech Marin will be guest-starring in the February 28 episode, "Tricia Tanaka is Dead," as David Reyes, Hurley's father. Caden Waidyatilleka appears as the young Hurley. Mira Furlan returns as Danielle Rousseau. Hurley finds an old car on the island; the flashbacks include Hurley's old workplace, Mr. Cluck's Chicken Shack. LOST Spoilers 3/10 - Courtesy of... ABC? LOST Rumors More Trips to the Past? Lost: Mobisode 5, "Operation: Sleeper"